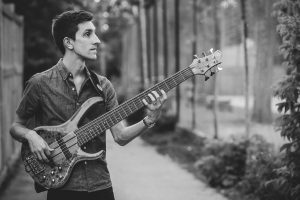 Brad Cheeseman is a jazz bassist and composer from Hamilton, Ontario. A much sought-after musician both on stage and in the studio, Cheeseman’s lyrical bass playing and melody-driven compositions have been featured on Canadian, American, and European stages, and captured on four original recordings. Brad Cheeseman’s previous releases include 2016’s Figurants EP, (a collection of compositions based on the landmark novel Infinite Jest), 2015’s Brad Cheeseman Group, and 2013’s Mixed Messages EP. These albums have received airplay across Canada, won two Hamilton Music Awards and have been nominated for two Toronto Independent Music Awards.